We are delighted to announce that ‘Man of Wool’, Oliver Henry is this year’ Shetland Wool Week Patron, and his hat design is called ‘The Roadside Beanie’. The inspiration for the hat came from elements of Oliver’s life, from which he drew sketches and illustrations. These were then interpreted into a design and pattern by his colleague Sandra Manson. Oliver has worked with Shetland wool for 52 years: he has judged, graded, sorted, worn, promoted, researched and been inspired by Shetland wool in his work at Jamieson and Smith, also known as ‘The Shetland Wool Brokers’. Oliver has worked with sheep and wool for over fifty years, so it was clear to him that they would be part of his design story. Fishing has also played a big role in his life, especially growing up on the family croft at ‘Roadside’, in the busy fishing community of Hamnavoe on Burra Isle. Oliver’s father and brothers had their own fishing boat and fishing was their livelihood. 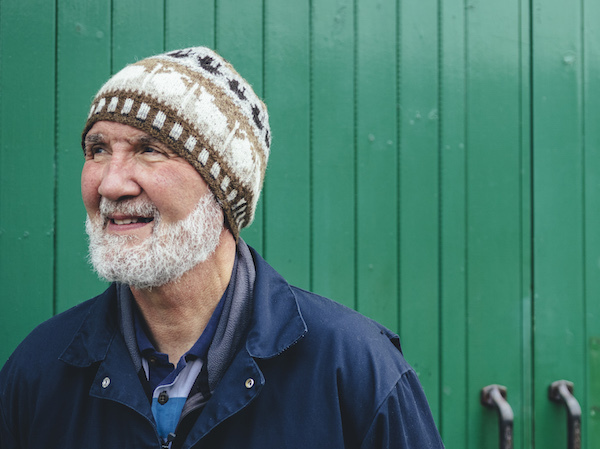 Unfortunately Oliver suffered from seasickness and could not carry on the family tradition of fisherman crofter, so turned to Shetland wool for his work and inspiration. Shetland Wool Week is honoured to have Oliver as this year’s patron. His passion and expertise for Shetland wool is infectious and he is a massive ambassador for Shetland wool and its people. He was also one of the original founders of Shetland Wool Week, which has now grown and established itself as one of Shetland’s most successful events. As we’ll be celebrating our tenth Shetland Wool Week it made sense for us to bring it back to its original roots and this has been reflected in the choice of patron. The Roadside Beanie pattern can be downloaded for free here or come along to our stand at EYF and pick up a printed copy. Oliver will be there too ready to answer any wool related questions, so drop by and say hello. 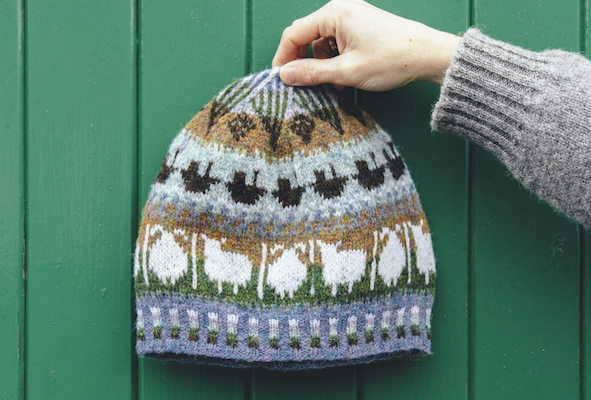 Knit the hat in any of the suggested colour variations, or come up with your own colour scheme, and wear it to Shetland Wool Week 2019 – identify your fellow Wool Weekers and compare hats throughout the week and at the official SWW 2019 photograph!